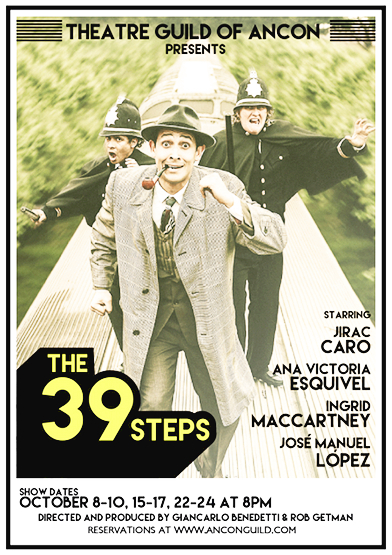 The play The 39 Steps is an adaptation of the 1915 novel by John Buchan and the 1935 Alfred Hitchcock movie. The play is about a man living a boring life when he meets a mysterious woman who claims to be a spy. When he takes her home, she is murdered and he, falsely accused of her death, runs from the law. This initiates an adventure that will take him all across Great Britain to find the true murderers and uncover the secret behind the mysterious 39 steps. This adaptation requires that all the adventure from the movie be reenacted by a four-person cast interpreting multiple roles. One actor plays the hero, one actress plays the three women with whom he finds himself romantically involved, and two additional actors play all the other role in the play: heroes, villains, men, women, children, and occasionally, inanimate objects. It is a spy comedy that reflects multidimensional talent from its actors, accompanied by an exciting light design. This play will be presented on the 8-10, 15-17 and 22-24 of October at 8:00 p.m. under the direction of Giancarlo Benedetti and Rob Getman. The Theatre Guild of Ancon is a national treasure in Panama since it is the oldest theatre in continuous operation. It was founded in 1950 by a group of Panamanian and American citizens who were interested in developing English language theatre in Panama. Our productions run the gamut of the theatrical spectrum — from modern dramas to comedies and family entertainment to musicals. Our stage has been the first step for performers such as Robert Loggia and Rubén Blades, successful directors such as Bruce Quinn and John Aniston (Jennifer’s father), and other professionals like Rick Belzer, currently a lighting designer on Broadway, and George Scribner, currently a Walt Disney imagineer. Today, the Theatre Guild is a nonprofit community theatre dedicated to developing the performing arts in Panama.